Currently the oldest female correctional institution in operation in the United States, MCI-Framingham houses women in a medium security context. First opened in 1877 as the Sherborn Reformatory for Women, the prison was founded during an age of social reform to protect female inmates from men. Clara Barton, founder of the American Red Cross, briefly served as the prison’s superintendent in the late nineteenth century. It functions today as a jail, house of corrections and prison and is one of few facilities in the state for women. 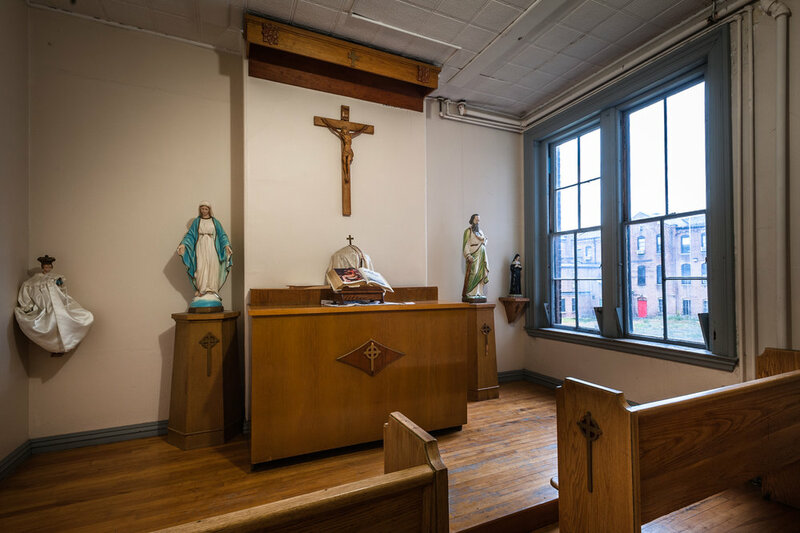 A large chapel on the third floor of the original administrative building is used for Protestant and Catholic services as well as a wide range of educational and social service programs every week. In addition to religious education and worship services, graduations, speakers and other events take place in the space. In the 1930s, two large murals were painted on the walls of this chapel by artists Charlotte Scott and Lincoln Levinson. Both were supported by the Public Works Administration. “Prison wall murals teach dignity of work and play,” the Boston Globe headline read at the time, crediting superintendent Dr. Miriam Van Waters with the idea. Before the murals were painted, Professor Francis B. Sayre of Harvard University donated two stained glass windows to counter the barrenness of the space in memory of his wife Jessie Wilson Sayre, daughter of Woodrow Wilson. The murals have been painted over while the stained glass windows remain today. A smaller chapel on the ground floor is also used regularly for prayer gatherings, mentoring and a range of other programs. Two full time chaplains, one Protestant and one Catholic, are responsible for all religious programming for inmates who identify as Buddhist, Wiccan, Muslim, Jewish or other spiritual and religious traditions.